Interns at the UN Assistance to the Khmer Rouge Trials pose during a strike protesting unpaid internships at the court on Monday, in a supplied photograph. 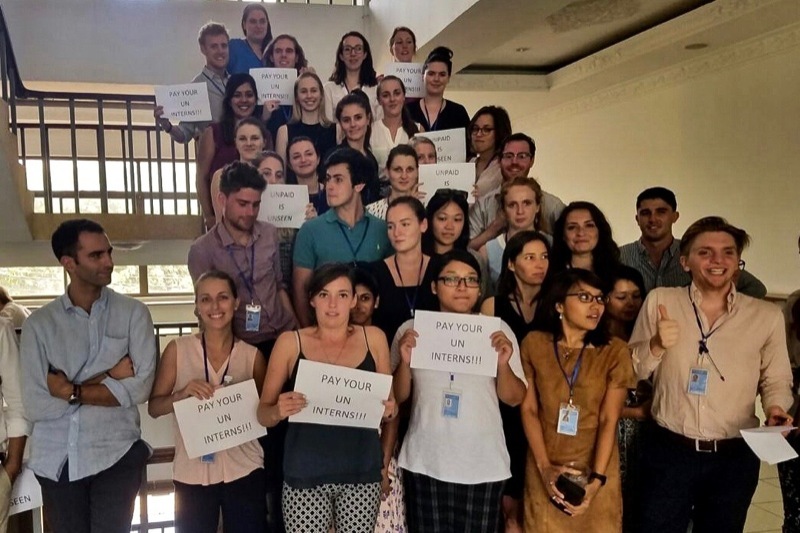 In solidarity with unpaid interns around the world, about 35 foreigners working for free for the U.N. at the Khmer Rouge tribunal took an extra-long lunch break on Monday, staging a one-hour strike in the court’s cafeteria. The very first “Global Intern Strike” was coordinated by the Global Intern Coalition, a group aiming to improve conditions for interns, with walkouts and protests staged in major cities from New York to Geneva. He said of the 46 interns currently at the court, 37 signed a statement in support of the strike calling for paid internships. Another 41 paid staffers or consultants signed, he added. “We the undersigned demand an end to unpaid internships at the U.N. Assistance to the Khmer Rouge Trials (UNAKRT) in support of internships being available to persons from all socio-economic backgrounds,” the statement said. “To this end we demand that internship positions as a minimum pay a subsistence allowance to allow all persons, regardless of socio-economic background, the opportunity to participate thereby making internship schemes a meritocracy,” it added. Interns at the court usually work a minimum of 34.5 hours a week and, aside from their visa costs, do not receive any allowances or reimbursements for expenses, Mr. Webster said. “We are aware of this in advance, but it is obviously inconceivable for vast numbers of people to be able to afford it,” he said. Anna Ricks, an intern who has been at the court for about five months and previously interned for the U.N. in Geneva for almost a year, said paid U.N. internships would make the crucial work experience accessible to a broader population. “I want to be surrounded by students and young professionals from developing countries…coming to the U.N. with their own views on how to implement better solutions to international problems the U.N. tackles daily,” she said. “That is why it is paramount that the U.N. reaches a consensus and starts paying their interns: to grant broader access to this institution,” she added.